If you have glanced outside for even a second you will have noticed a rare feature graced on us Brits – the sun. Yes, Spring is finally blooming, and I am bloomin’ excited (pun intended.) Spring is just that perfect middle ground and also one of, if not the prettiest season. Welcoming back the beautiful flowers and the whole colour palette of spring just makes me so happy. And I think we can all agree, the best part of spring’s arrival – the longer evenings. Being able to still see outside at 6 even 7pm is the best feeling ever. Saying hello to the sunny weather is great, but in England we’ll still be seeing the chill no doubt. So what better way to enjoy the evening outside, despite the chill is to get yourself some blankets and gather around the fire (and at this point I feel it necessary to say please be careful and responsible with fires). There’s something about fires which are so sociable, I honestly don’t know what it is, but I love it. Maybe have a little barbecue going too, have some good music, and just enjoy being warm from the fire and being able to sit outside past 5pm. Now, what would a friendly gathering be without having some good food on the go? 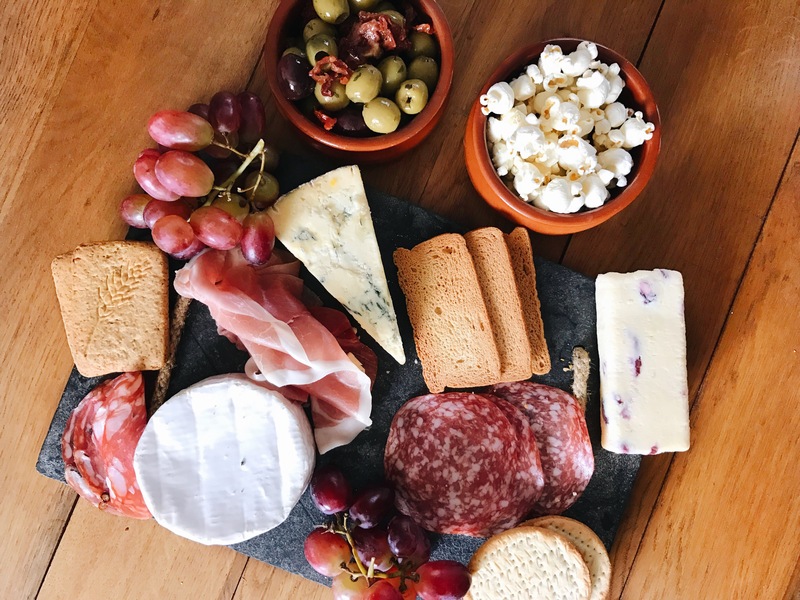 Personally, I looove party food/tapas/nibbles – it just feels like you’re not actually eating your weight in cheese and hummus, and tastes great. Some perfect spring food ideas for you could be a classic cheese board. 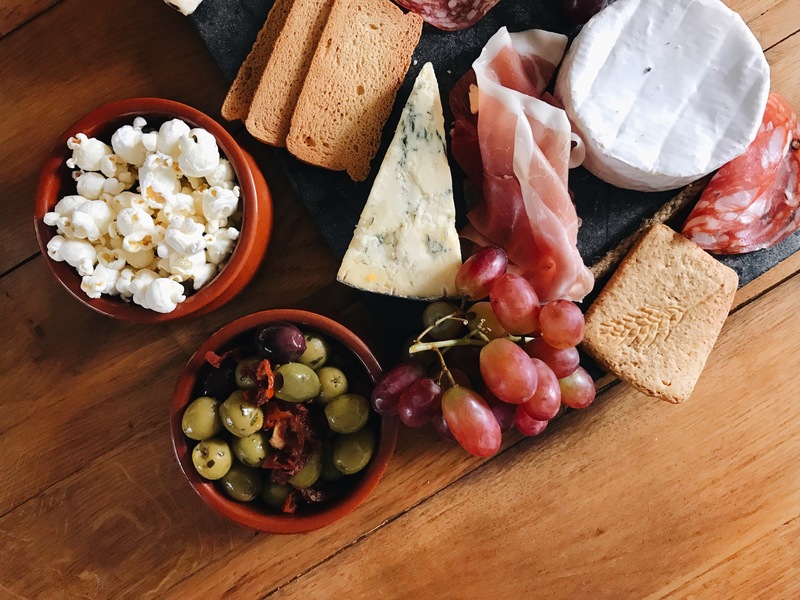 When it’s this sort of cuisine, a cheese board is a great main piece – there’s variation of taste, it’s filling, easy to eat and who doesn’t love cheese, right? And of course you can add soya or tofu cheese for any non dairy lovers out there. I like to add something a little sweeter to the board, a classic is grapes but you could add fig or apricots. Then, got to have that saltiness – maybe some parma ham or salami? Quorn salami works just as well if you’re a fellow veggie, or I love olives with sun-dried tomatoes! 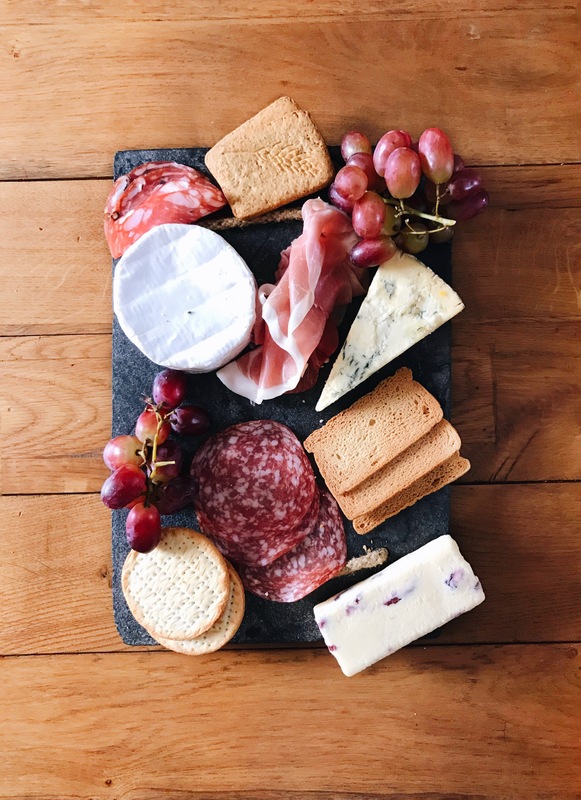 Lay out some crackers or some crusty bread, maybe get a bit of chutney in the mix and boom – the perfect cheese board. Now, whats a gathering without something and dip am I right? And it’s so easy to do! You can use pitta bread, vegetables, breadsticks and match it with some dip or sorts, my personal favourite would be some red onion hummus. And that’s that. Another snack you could add is a personal favourite of mine – popcorn. A very neglected snack. But it’s perfect, it can go with anything, it’s easy to make, not to mention it tastes great. And if you want to jazz it up a bit? Get some of the parma ham from your cheese board, get some cheese, put a dash of black pepper on there and taa daa. You can also make it sweet, of course, maybe with some cinnamon sugar? Or if you can’t decide – go for a classic sweet and salty mix! Not to forget the fellow sweet tooths out there. But with so much food you don’t want to go too heavy with cake or chocolate. Why not try sorbet? Frozen yogurt? Or coconut ice cream? It’s cold, somewhat healthy and will definitely satisfy those sugar cravings! If you want something a little more solid you could make some yogurt dipped strawberries or starwberries and cream – which yes is more of a summer thing, but hey, who’s going to judge? With all that food you’re definitely going to need a little tipple to wash it down. My personal choice at this time of year is cider. Its the perfect sociable drink to sip at any occasion and it goes great with nibbles. I love Rekorderlig Cider, it was one of the first drinks I ever discovered and it’s been a favourite of mine, especially at this time of year. Maybe it’s because it reminds me of so many evenings spent in fields with friends, round a barbecue sipping cider or because their bright and refreshing flavours are just, the taste of spring. If you’ve never tried Rekorderlig Cider before, the best way I can describe it is ‘colourful cider’. They have some amazing flavours such as strawberry and lime, pear, wild berries, passion fruit and my personal favourite mango and raspberry. It’s such a crisp taste – perfect to sip by the fire or alongside some nibbles with friends. And if you want to get fancy with it? I’d suggest serving it over some ice with either some garnish, mint or lime is always a good options, or you could go all Pinterest and take a cocktail stick and pop some lime raspberries on there. At this point I’d also like to add please drink responsibly. Depending on who you’re with, having some little things to do is always a back up. I’d always suggest board games or card games – they’re fun and sociable and get everyone involved. Maybe become 8 years old again and grab all your blankets and duvets and make a fort, the perfect cove to watch a film or have a good old chin wag. Or maybe just sit down, and spend some time with friends. Forget technology and social media for a moment and enjoy the spring evening with lots of good food and drink. *DISCLAIMER* This was a sponsored post in collaboration with Rekorderlig Cider. However all opinions are my own. 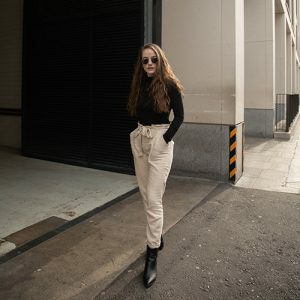 A Lazy Girl’s Guide To Style. Brilliant ideas here em! Makes me want to plan a bbq summer party! Ooh I can’t wait for summer – but you’re right Spring is a beautiful season and one I’m definitely enjoying! The brighter evenings and dash of sunshine really boosts my mood (especially during exam season). 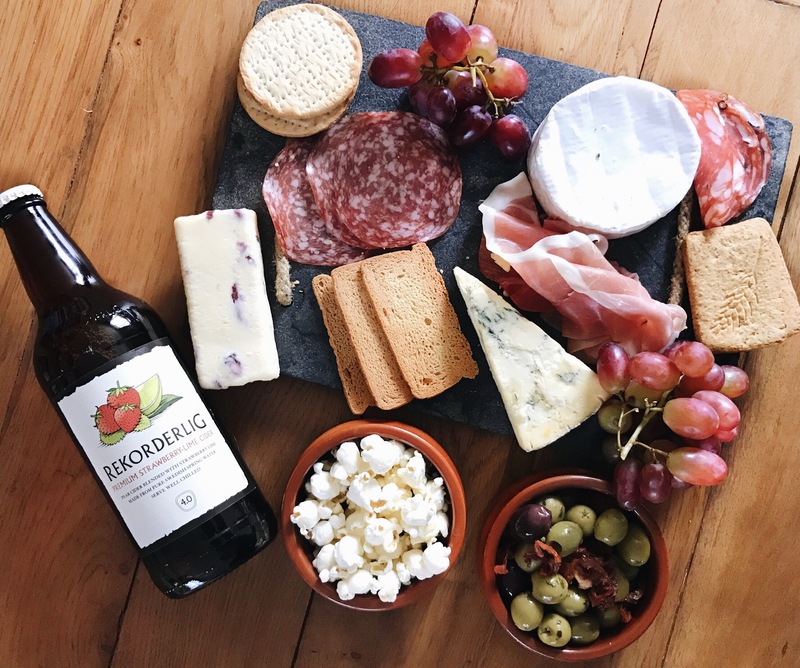 I really love this idea of having a get together outside in the evening with a cheese board and cider! I adore Rekorderlig cider (the berries one is my all time fave) and feel like it’s perfect for Spring/Summer evenings! Food and cider are our fave things, especially during spring/summer. Your photos are absolutely stunning and now you’ve got me craving cheese – a good Camembert would do! Thanks for sharing! Mine too! How can you not love them?? Definitely! Ahahaha thank youuu! Oooo I do love a bit of Camembert haha! This post just increased my cravings. Yes cheese board goals! There is really nothing better than snacks and cider (Rekorderlig passion fruit Is my favourite) also this photography is amazing keep it up! OMG looking at that cheese board is making my mouth water! I love a good cheese board and sitting in front of a fire makes a perfect cosy night in!